Wheelchair Friendly Special Requests - At Kingfisher Barn, we cater for guests and groups with all forms of disability including wheelchair users. The site has been designed so that much of the accommodation is set out on the ground floor level, no stairs and with wheelchair accessible doorways for easy use. Pet friendly too so all the family can spend time together making beautiful and lasting memories. The self catering lodges and cottages are perfect for a weekend, week breaks, long-term private bookings, and group visits. We are ideally based for exploring the surrounding areas and for lots of activities. Hazel and Stable Cottages have been designed specifically for wheelchair users with all accommodation on the ground floor and wider doors for easy wheelchair access. The accommodations have wet room shower areas. Also, family bathrooms, grab rails and sideway transfers to the toilet. Most bedrooms and bathrooms have ceiling tracking for the use of a mobile electric hoist. Kyte and Kestrel Lodges also offer a wet room, grab rails, sideway transfers and ceiling tracking in all bedrooms and bathrooms on the ground floor. These two lodges are very spacious and allow plenty of freedom to move around. We can place any of the items above in your cottage or lodge, so when you arrive, they are available for use. When making a booking, please inform our staff of the items you will require. We like to have everything organised for your stay. Please note that although the facilities are available to assist in making your stay more comfortable, the equipment will only be placed in your accommodation if you request it on booking. Also, please be aware, there is a charge for some of the items of equipment - please contact us for more information. 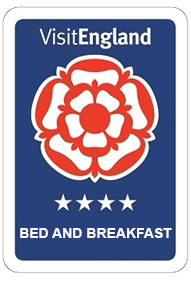 If you are looking for a shorter stay, we also have some Bed and Breakfast rooms; beautifully designed with wheelchair users in mind. All of our rooms are on the ground floor, and one unit has a wet room which allows for a shower chair. If you mention to us at the time of booking that a disabled room is required, we can then place you in the most suitable room. We have a variety of useful numbers we can give you including the local doctors; also please note that we are registered with them. please call the team at Kingfisher Barn.